From the late 1800s onwards, for almost a century, the Mt Gipps Hotel brought together fascinating adventurers from far and wide who yarned stories of their Outback travels with one another. With a cold drink in hand and red dust on their boots, the hotel hosted many a visitor, from explorers to soldiers to miners and artists. The Mt Gipps Hotel closed in 1987, remaining silent for three decades. 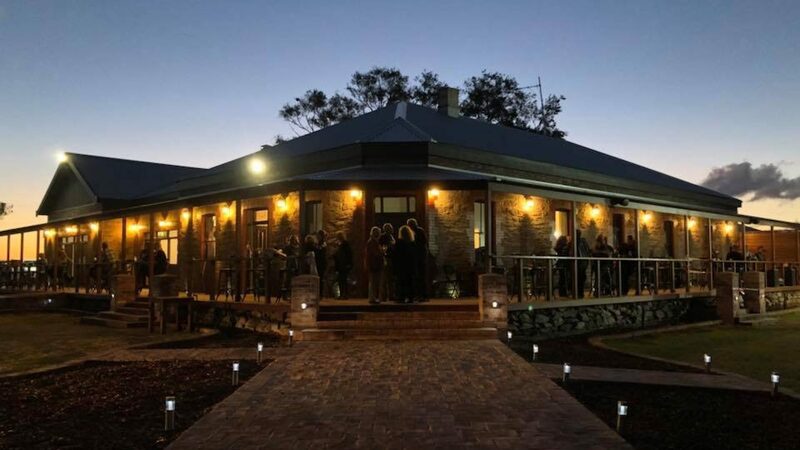 But as of 2018, this historic venue is once again the lively home of travellers and storytellers, with the brand-new refurbished Broken Hill Outback Resort bringing today’s amenities to the rugged Outback so beloved for generations untold. After years of neglect, this heritage building has been restored to its former glory, and is the centrepiece of the new resort. 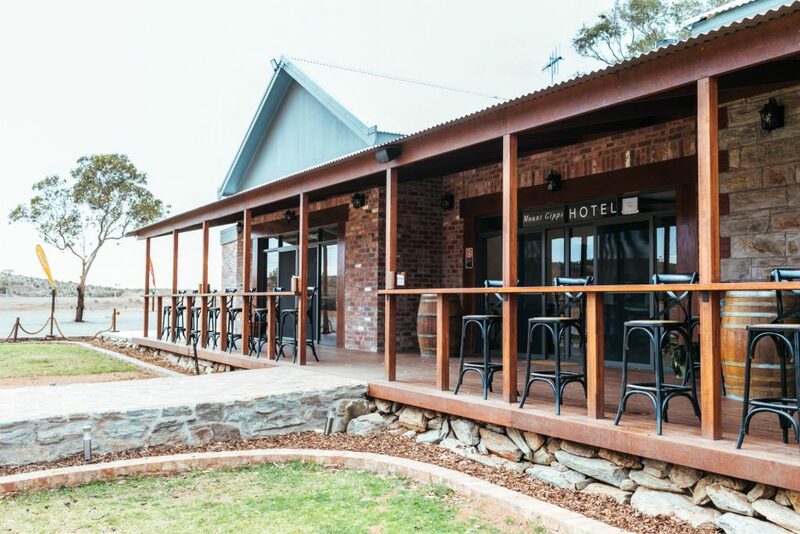 This Broken Hill hotel is now home to a restaurant catering for up to 300 guests, a bar and bistro, with plans in the works for a day spa and and galleries showcasing local artists. The picturesque setting overlooks the Barrier Ranges, and is located just outside of the bustle of the modern city of Broken Hill – a mere 14 kilometres away, but as if in another world. As well as self-contained deluxe cabins, our Broken Hill accommodation offers a taste of luxury to the camper & caravan adventurer, with 80 grassed powered caravan sites and 20 grassed unpowered caravan or camping sites. Camping guests of our Broken Hill caravan park can enjoy the brand new camp kitchen, a high-spec, disabled-friendly amenities block as well as laundry facilities – and of course, these guests are welcome to share in the luxurious amenities and deep heritage of the Mt Gipps Hotel. In the future, the Resort plans to reveal a swimming pool for use year-round (heated through the cooler months), as well as an outdoor cinema which will make for a wondrous evening under the stars. On-site classes will also be available. Broken Hill is renown for its art scene, and guests will have the opportunity to learn from talented local artists, with indigenous art classes also available. The resort will also showcase local produce and indigenous food. Numerous local tours will depart daily, and can be arranged during your stay. For information on tours currently available in the Broken Hill region, see TRI STATE SAFARIS. The Broken Hill Outback Resort is the perfect spot to take in our wide-open skies and appreciate the vast and truly unique horizons of the Australian landscape. Launched in late 2016, Out of the Ordinary Outback encompasses the award-winning tour company, Tri State Safaris and an accommodation group that includes Warrawong on the Darling in Wilcannia and the iconic ‘oasis in the desert’, The White Cliffs Underground Motel. Also under their management is the Tourist Lodge and The Argent Motel in Broken Hill, Cobar’s Copper City Motel and the Ivanhoe Hotel Motel. 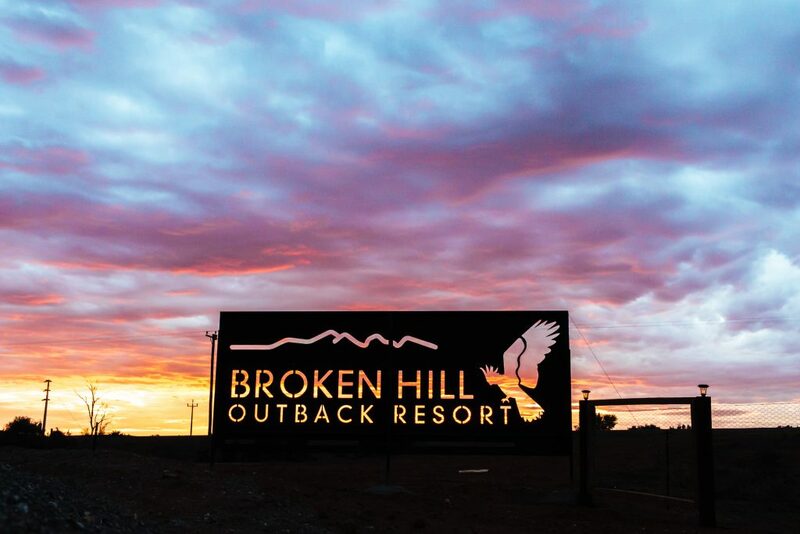 The company’s newest development, The Broken Hill Outback Resort has recently opened in March 2018. Following on from the philosophy that has long guided Tri State Safaris, Out of the Ordinary Outback’s focus is to provide guests with memorable and authentic experiences as they explore the far west of New South Wales. The various properties from Out of the Ordinary Outback allow guests to experience the western wonders in myriad ways; be it in the heart of the historic city of Broken Hill, from the tranquil banks of the Darling River or from your own dugout room beneath the surface. Across the many destinations on offer, there is spectacular scenery to take in and a diversity of things to do and see. Follow Dreamtime stories though rock art, wander across ancient landscapes, sit by a billabong as the colours of the sunset unfold, meet delightful characters from the bush. Whether guests choose to sleep in a comfy hotel room, in an outback pub, in a tent by the river or beneath the stars, Out of the Ordinary encourages everyone to understand why the outback spirit inspires and humbles us. For something truly out of the ordinary, join us to experience the rich tapestry that makes our country so unique. Take a journey that will stay with you long after the coloured dust has disappeared from your shoes.